I hope that at least the MFL teachers among my readers will have understood the title of today’s post! As we all know, from September 2013, schools will no longer be required to assess their pupils using National Curriculum Levels at KS3. The DfE is not replacing this system of assessment and reporting, preferring instead to allow schools “to introduce their own approaches to formative assessment, to support pupil attainment and progression”. Whilst the DfE argues that NCLs are “complicated and difficult to understand, especially for parents” it is by now what they are used to, and has been a fairly useful, if somewhat arbitrary way to compare children’s progress across a range of different subjects. Did someone say curriculum reform? With this in mind, most schools seem to be sticking with NCLs in the absence of any viable replacement. (I have yet to meet a teacher whose school is scrapping them, but if yours is I’d love to hear from you! @MonsieurRMC). The big problem with National Curriculum Levels in MFL has always been that, since pupils are awarded a distinct level in each of the four skills (listening, speaking, reading and writing), it is immensley difficult to give them an overall level for their progress in the language as a whole. Some departments ‘average out’ pupils’ levels, but this has always struck me as an extremely misleading method of reporting; a pupil may achieve a level 4 for reading but only a level 2 for writing and be awarded a level 3, despite the fact that he or she is not working at level 3 overall. 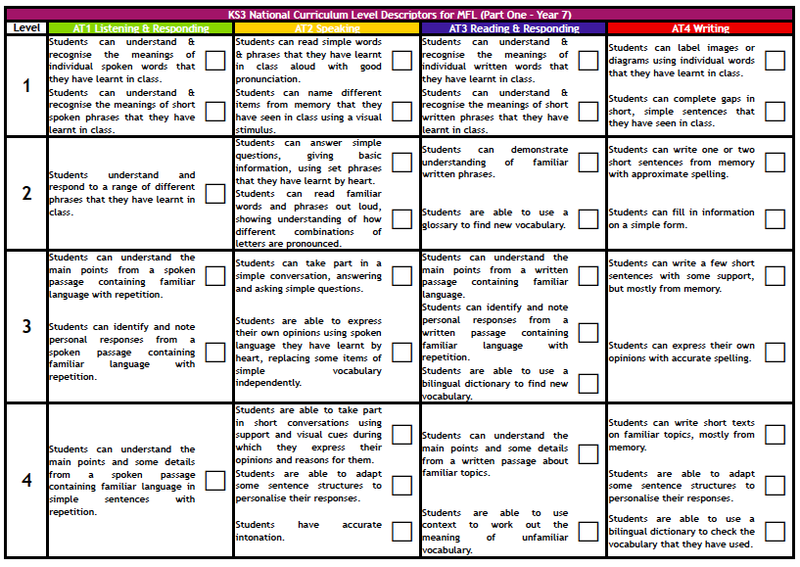 From September 2013, I will be directing my department to assess and report pupils’ levels in a slightly more comprehensive way: all y7 parents will be sent a copy of the NCL sheet below, and each pupil will have a personal copy to keep in her book. When pupils have demonstrated sufficient evidence that they have fulfilled any of the criteria for any one skill, the teacher will record this with a tick in the relevant box. Pupils will only be awarded an ‘a’ sub-level when they have fulfilled all criteria for all skills at that level. Pupils and parents will be able to track progress and identify areas for improvement simply by looking at their individual progress sheet at any given time. This system should also facilitate reporting differences between other sub-levels; a ‘b’ sub-level will be awarded to a pupil who only needs to evidence one or two more criteria for that level. A ‘c’ sub-level will be awarded to a pupil who has fully achieved the level below plus one or two criteria of their next target level. My hope is that this system will make it easier for teachers to continually assess and keep track of their students’ progress, and for pupils and parents to identify areas in which the pupil needs to improve. Both of the PDF documents with the levels for Y7 and Y8 are available below, and constructive feedback is always welcome! 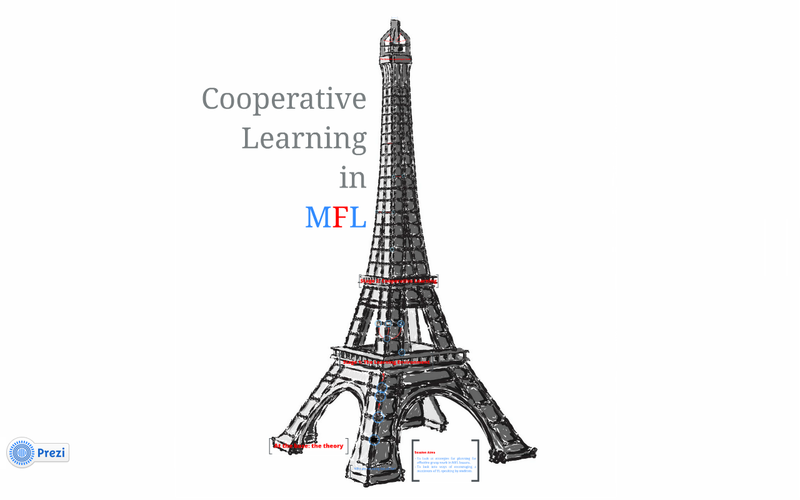 to look at strategies for planning for effective group work in MFL lessons. to look into ways of encouraging a maximum of TL speaking by students. It is important first and foremost to remember who we (secondary teachers) are doing all this for: teenagers. Stroppy, difficult, impetuous TEENAGERS. Studies have shown that there is a reason that we are so quick to assign these adjectives to adolescents; the teenage brain is not a young adult brain, but an entity in itself. It seems self-evident when you say it out loud, but I confess that I had never considered that teenagers were programmed to behave in the ways they do because of their brain chemistry until it was pointed out during a CPD session run by science teacher and research student Claire Tyson when I was working at Homewood School & Sixth Form Centre in Kent. Teenagers typically experience lack of foresight; emotional volatility; impulsiveness; lack of thought for others. Heightened sensitivity to dopamine means that teenagers value rewards more heavily than adults. A similar sensitivity to oxytocin means that teenagers treat peer exclusion in the same way as threats to physical health or food supply. Teenage brains don’t register delayed gratification – the appeal of fun now is too strong! When we consider all of these points, it is easy to see that the typical classroom is far from being tailored to teenagers’ needs and not conducive to helping them to learn in a way that is going to be most effective for them. Yes – teenagers need to learn to adapt to a formal environment, but not through force. As teachers, it is surely our job to help them to learn in the best way for them? Do teenagers relate to their environment in the same way as adults? Can we have the same expectations of teenagers as adults? Should we treat teenagers differently because they are teenagers? In order to exploit this fact, and simultaneously tick the Ofsted boxes that value a variety of learning tasks (from individual, to pair and group work) I set about rearranging my classroom: I used grouped tables rather than rows to facilitate discussion and make it easier to switch between different types of task; each table became a team which could win points for good collaboration and effort; I designed target-language manage-mats based on those I had come across at a Kagan method CPD session to stream-line my classroom organisation and ensure that all pupils could be actively involved in their learning. “80% of teachers’ memories of ‘best’ learning experiences are active, collaborative, learner-driven and learning-focused”. Some delegates argued that this was all very well, but that with a curriculum to deliver, there was no time for all this ‘extra’ stuff. Watkins succinctly retorted that he had proven that orientation towards better learning rather than performance actually improved performance itself! With this in mind, I aspire to plan activities which promote collaboration and cooperation to improve learning and skills. Some of these have been mentioned in previous posts, but you can never have too much of a good thing, right?! This is a great activity when practising skills that have a particular method to follow, like conjugation or negation. Rather than having students complete practise exercises in the traditional way, working through a textbook or a worksheet, the worksheet is split in half and students complete the acivities in pairs. As they do, they explain what they are doing to their partner who watches and listens, and, if they need to, questions and critiques. This process reinforces the method in both students’ minds. RallyCoach lends itself particularly well to differentiation because you can pair stronger students with weaker ones for coaching purposes. When practising skills as a whole class, generally with mini whiteboards, I once again ask students to work in pairs. The manage mats I mentioned earlier assign each student in the group a number 1 – 4 and the letter A or B. Quite simply, person A has a go at the first activity, person B at the second, and so on. Since both partners win a point if theirs is the first correct answer shown, the student not writing is still motivated to check that their partner’s work is correct to avoid wasting time making corrections. This works on the same principal as the pair work activities, but uses the numbers on the manage mats instead of the letters. Each student is allocated a role for each exercise, and the roles are rotated throughout the activity to ensure that everyone practises the different skills. Rather than solely using choral repetition as a way of drilling vocabulary, which enables each student to repeat each word a maximum ten times or so, I use Quiz-Quiz-Trade to maximise the practise stage for every individual. Students circulate, each with a card with a target language phrase and its English translation written upon it. They pair up, and partner A reads the target language phrase. Partner B responds with the translation and then they swap roles. Partners then swap cards and circulate again before finding another partner and repeat the process. Assigning roles during a running dictation activity encouraged teamwork & discussions about learning, reinforcing students’ understanding of the language structures they were practising. 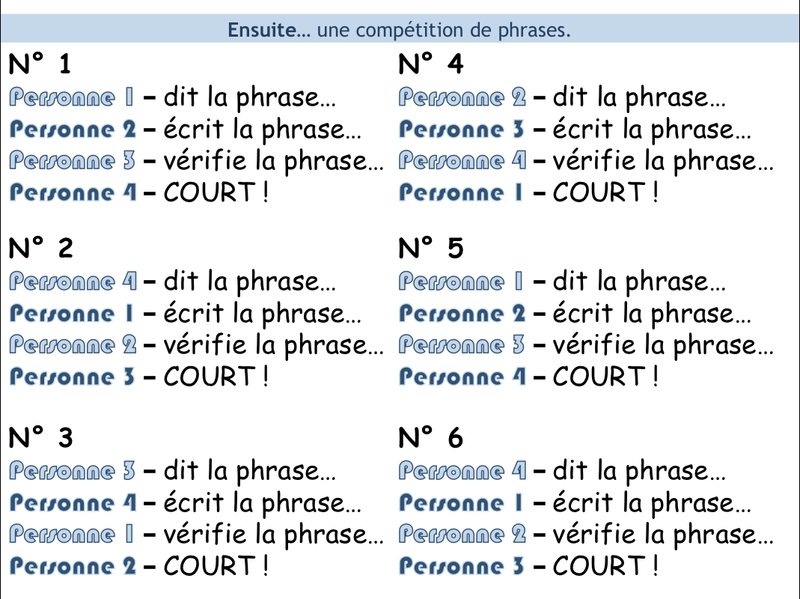 I won’t say too much about this; details can be found in my last post about French Phonics. Teaching these to my students has really paid dividends, because not only do they make far fewer of the common mistakes to which MFL teachers have become accustomed, they are also now far better at decoding words for themselves and thus able to expand their own vocabulary independently of any input from me. Again, information about the use of songs can be found in a previous post. At a PGCE mentors’ conference recently, the lecturer mentioned the practice stage of the PPP model (Presentation – Practice – Production) as being the weakest for trainee teachers, and urged us to show them how to “find 45 excuses to get the kids to say the same word”. This turn of phrase really hit the nail on the head, because we all know that it is through repetition that students improve their fluency. Choral repetition can, however, become boring. I therefore try to vary ‘repetition’ activities with a ludic element in my lessons to ‘hide’ from students the fact that they are repeating vocabulary. This could simply be by using dice to take it in turns to build sentences using the vocabulary and structures we have been practising. Similarly, having students play noughts-and-crosses in pairs using language on the board rather than playing as a whole class maximises pupil use of the target language. My favourite game, however, has to be Empreinte Digitale or Huella Digital: student 1 selects a phrase at random from a numbered list and reads this to the group. Students 2 – 4 then race to put their finger on the correct picture in a grid in the middle of the table. Each student takes it in turns reading, so all students are able to practise their speaking and listening skills. Last week I did the thing that most teachers would be terrified of doing, and asked my students to give me feedback on my lessons. I can hear you all clamouring as you read: “are you mad? !” or the far more likely “it’s not students’ place to comment on our teaching – we are the professionals!” Well yes we are… but like it or not we are catering to a specific audience. I’ve said before that teaching is not about entertainment, and I stand by that – I’m not just some glorified clown; but who knows what helps them learn better than those learning themselves? We are professional educators, but generations change, and the fact is that the kids learn differently and respond differently to the work with which they are presented. With this in mind, I decided to open myself up to a bit of criticism. The students in my y10 classes have already had to evaluate their own performance after controlled assessments and set themselves targets for the term, and they are used to me marking their work with two What Went Well comments and an Even Better If, so I was confident that they would be able to evaluate my teaching constructively. I was right to take the gamble. I gave the girls a piece of scrap paper each and asked them to think about their lessons with me so far this year and, with their learning in mind, give me two WWW comments and one EBI for their French lessons. Now I’m not really one of those soppy “in it for the kids” kind of teachers, but what they wrote almost made me cry. I know – the shame. Wow. I was truly overwhelmed. “Ok, ok,” you say, “you’re clearly in some sort of teaching utopia – the Holy Grail of schools. This wouldn’t work for the rest of us.” Well, actually, no. Yes, my school is a girls grammar school, but in a fairly poor region, and with a much wider catchment than most grammar schools. Some of our students have some serious BESD issues. It’s the supportive atmosphere in my class, and more importantly throughout the school, that has led the girls to make these comments. Even one of the moodiest girls I teach came by after school on the day we did this to “have a chat in French” while she waited for her friend who was in detention. The student-teacher relationship was a key factor in almost every single student’s appreciation of my lessons. Whilst I’m not there to be liked, it makes it so much easier to take them on a learning journey with you if they trust you and feel supported by you. Interactive/active/engaging learning (their words) was the way they found they learnt the most on lessons. See my posts on Kagan and dialogic learning for more ideas. So there you have it: I put myself on the line and took one for the team! Now let’s start teaching the lessons that the kids really want to go to!! ICT in MFL – acronym heaven! My school recently advertised for a member of each department to be ICT Champion for their subject… naturally, I couldn’t resist! But before writing the one-page proposal for how technology could be applied within the MFL department and why I was THE person to do it, I had to have a think about what I actually knew. We all remember well Qs 16 and 17 of the Professional Standards for Teachers – you know, the ones about passing an ICT test that had nothing to do with programmes people actually use, and the one that you validated by using a ‘custom animation’ in your latest PowerPoint that your mentor thought had come straight out of Star Trek. But what about the Q that time forgot: Q23? In observing my trainees, I rarely pay much attention to what they’re doing with PowerPoint/SmartNotebook/Promethean (delete as applicable) – for me, the point in using ICT in the classroom is to enable a higher level of engagement, interactivity and independence from the pupils: Q23 – Design opportunities for learners to develop their literacy, numeracy and ICT skills. Ie: the kids have to use it too. The VLE at my last school was (although not perfect) truly interactive and pretty user friendly: it was called RealSmart. Using the ‘mind-map’ application (unsurprisingly named ‘RealMap’), I created a three-hour long project for year 7 students on French historical periods. Lesson 1 saw students in groups named after French regions logging on to the Histoire française RealMap from their netbooks and clicking on the coat of arms for their region. They were then presented with a series of reading and listening resources based on different periods of history (one per group) which they used to complete the exercises on their worksheets. All of the language in the resources was based on structures we had seen throughout the year so this was a great way to show their use in a contextual situation. During lesson 2 students broke away from their former groups to form new teams, with one student for each period of history per team. They then shared their information, teaching the other students in their group, before planning the final activity to be completed in lesson 3 – creating a timeline of French history. This project was not only a great way of introducing cultural information into the MFL classroom whilst still practising essential language; it also enabled students to develop their ICT skills in a controlled way, without just resorting to Google and Wikipedia. Whilst the next offering wasn’t really something that I created or even used in lessons, I couldn’t write a post about ICT in MFL without mentioning it. VocabExpress is a web-based programme for – you guessed it – learning vocab. We all know that there is just not enough time to drill vocab and teach structures in lessons, so VocabExpress is the ideal accompaniment to any MFL course. Students log on with their own ID and complete different learning activities for a given list of words, chosen by the teacher (all of the vocab that has been uploaded is taken from the main coursebooks and so can be easily linked to any GCSE or A Level topic). The programme is intuitive, so when students make mistakes, it remembers and gives them those words more often. The teacher can monitor everything they do, from when they log in to what exercises they have completed and how well they did. Scores are then converted into points and a leader board is displayed of the whole class. There are also rankings for each class within the school, each school in the local area and there is even an annual national competition where schools from across the country compete for points. The students LOVED it; the competitive element coupled with the fact that they could log on and learn whenever they wanted made VocabExpress a real success. The third and final activity in my list of favourite uses of ICT in MFL is a shameless piece of theft, but I am sure that its creator will not mind me stealing it! Once the blogs had been designed and written, students were asked to include a space for ‘reader comments’ just like a real blog. They then left their netbooks in their places and moved around the room, reading their friend’s texts and leaving comments in French (which had been introduced previously). This was such a simple and yet amazingly creative idea, and an excellent way to get students giving their opinions in a real context. If this had been coupled with the RealSmart blogging facilities (RWeb or RCast) this would have been a truly interactive experience. Now I know what the more cynical among you will be saying to yourselves: where did all of these bloody netbooks come from?! It’s true that 95% of the students at Homewood had signed up to a part-rent part-buy laptop scheme which meant that they all had their own netbook. I can’t deny that, if this isn’t the case in your school, buying a laptop trolley for a department can be very costly. Most schools, however, do have ICT suites which, with some planning, could be booked for a series of lessons to enable some of these activities to take place. The main point is that you really should make the effort – it will be well worth it!